Lao Tsu, also known as Lao Tzu or Laozi, is an ancient Chinese philosopher and sage, and an absolutely central figure in Asiatic culture. He is known as the author of the Tao Te Ching or Daodejing and the founder of Taoism. In traditional China, Taoism is a way of living in harmony with the Tao, "way", "path", or "principle", something that is both the source of, and the force behind, everything that exists. Throughout history, Laozi's work has been embraced by various anti-authoritarian movements, because his style is designed to elicit critical thinking through ambiguousness. 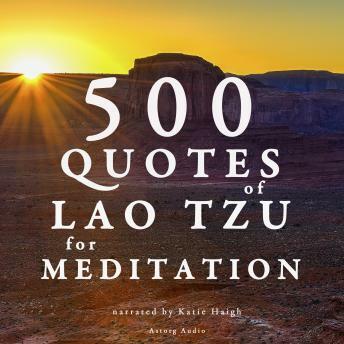 We have selected for you 500 of his most profound quotes, to guide you through meditation, and help you approach the Path as you delve into the Old Master's philosophy.